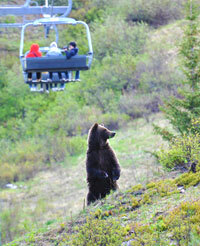 The Lake Louise Gondola is one of the best places on earth to see wild Grizzly Bears in their natural environment. With almost daily sightings, many of our quests are treated to this rare and awesome spectacle of nature. Stay at the Great Divide Lodge and ride The Lake Louise Sightseeing Gondola! The Great Divide Lodge is just 17km west of Lake Louise (10mi), and is just across the BC border. The Best Grizzly Bear Viewing & Scenery in the Canadian Rockies! Located just 17km from the Great Divide Lodge in Banff National Park, is the Lake Louise Sightseeing Lift, Gondola & Interpretive Centre! The Lake Louise Gondola offers a unique opportunity to dine in the beautiful Whiskey Jack Lodge, ascend to an awe-inspiring viewpoint, and to learn why they are the Home of the Grizzly Bear. Visit lakelouisegondola.com for more details. 2018 Gondola packages will be posted soon. Please check back for updates.